This seemed like a timely quote given the Dallas shooting last Thursday evening. Here’s my attempt at the rundown. Fair warning: the story’s changed more than a few times and I’m starting to get a bit dizzy. The bare bones details are that Amber Guyger, a white Dallas police officer, shot and killed Botham Jean, her black neighbor, last Thursday night. In his apartment. While she was off duty. Here’s the breakdown from the last week. Part 1: Botham Jean was at home. In the middle of the night Amber Guyger came to his door in uniform and shot him twice. She claimed she walked up to Botham’s apartment thinking it was her own, her keys didn’t work, and she thought he was an intruder there to kill her. Part 3: Another Dallas police officer spoke with NBC 5 and shared Guyger’s initial report about the event. Guyger was with the department’s elite Crime Response Team and had just finished a 14-hour shift serving warrants in high-crime areas. Once home she took the elevator to the wrong floor, went to what she thought was her door, put the key in and struggled with the lock. Guyger put down the items she was holding and was still struggling with the key when the resident swung open the door and startled her. Guyger believed Jean was an intruder and shot him with her service weapon. Part 5: Now Guyger’s saying the door was slightly ajar when she arrived and it fully opened when she inserted her card key. The main problem with this detail is a video posted showing the apartment complex doors are weighted to close automatically. Part 6: Oh, and then there’s the bright red doormat that was in front of his apartment. So many questions that all boil down to one thing…isn’t there anyplace safe for a black man in America? 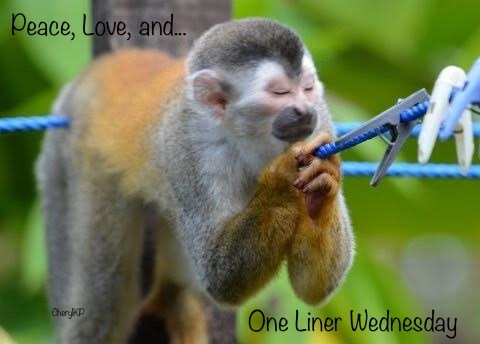 Linda hosts One Liner Wednesday. Check out her blog to meet some other participants. Next Next post: small bites: But my good friend/favorite neighbor/college roommate is black! I’m tired. No other words to describe my emotions. Just tired. That whole incident just doesn’t pass the smell test. I kinda don’t believe she didn’t know where she was. I kinda think this feels like deliberate murder. I’m hoping for a true investigation, and justice for Mr. Jean. So many icky feelings. Nothing about this feels right. I try not to jump to conclusions but there’s steady investigation and then there’s ignoring common sense. Thank you for reporting on this, Laura. Being tired and confused is understandable, but killing someone with no provocation should get a person off the street. There are at least two levels of intense investigation needed: one for the terrible injustice of a man murdered and the other for what is wrong with a system that allowed this to happen. Exactly. I’m hoping we might get both. I’m embarrassed by my home state sometimes. She needs to prosecuted to the full extent of the law. No excuses, no special treatment. I think we all have shame to bear. And yes, I hope they come to their senses and realize there cannot be any special treatment here. I am interested in finding out what really happened, but the whole thing just rings with how our society is behaving lately. Had a conversation with friends the other night – all but two of us being “white” – about white privilege and the NFL protests. It makes me sad and angry all at the same time. It is all of the feelings all of the time. But I’m so glad when I hear that people are talking because that’s where all of this starts. Exactly. We have some friends who will not even try to understand. Listening is the start. Opening your heart and mind is the next step. This is but one example of there are so many things wrong in so many ways. They just keep showing up, one after the other. It can be discouraging. SO many questions, Linda. Even if we gave her an EXTRAORDINARY benefit of doubt (aka running on adrenaline at that point) and decided she still would have drawn her weapon on a white man, we (white people) get that split second benefit from our skin color. And that split second would have been long enough for him to identify himself or for her to realize where she was. My heart breaks for his family and friends. Would never have happened to a white man. How the hell could she not know she was not only in the wrong apartment, but on the wrong floor? She didn’t wonder who put the red rug at her door? When the door opened, she didn’t think, “where did this furniture come from”? Hmmmmm, how could this tragedy have happened! Ooooo, here’s a thought….she was s**tfaced drunk or stoned….or both. Shame on the Texas Rangers. a) First instinct with white man wouldn’t have been SO MUCH DANGER I HAVE TO SHOOT. b) This ridiculous story would never have been attempted with the public for justifying shooting a white man **in his own home**. c) Police department would be less likely to allow shifting stories because white outrage would have demanded a proper and public investigation. This story is absurd beyond words. There’s a fine line in this story, where race becomes the issue. Getting off at the wrong floor, going to the door, being frustrated – yes, all that could happen. Shooting the man who opens his own door – nope, I don’t think that would have happened if he had been white. Exactly. I get frustrated by folks who say she was exhausted after a long shift – possibly? probably? Because it only explains how she *might* have ended up at his apartment (discounting the neighbors hearing her shout “let me in”) and not the freaking shooting. Not even in his own house, apartment, yard, etc. It is infuriating. Exhausting. Never ending. I have a hard time understanding where black men and women find the strength to persevere in this country. This is based on the phrase I used as an excuse while i was shirking not working in an office, https://rebelfish.blog/2018/09/12/a-happy-worker-is-one-liner-wednesday/ thanks for letting me join in. It can happen to anyone – wrong place, wrong time. At least you didn’t get shot. Lol, unusual in this day and age!